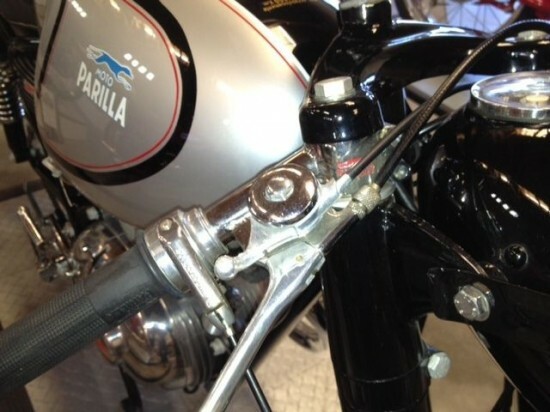 This is the first Moto Parilla I’ve seen come up for sale. Considering how often I see the name bounced around the classic bike community, I was surprised at how few of them were actually made. 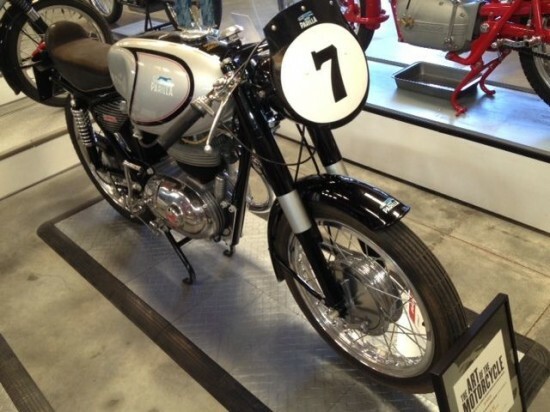 Giovanni Parrilla [note the second “r” in his name compared to the bike] first displayed his single cylinder creation in 1946, and his small displacement machines found success on both road and track until the rise of the Japanese two-strokes made Parilla’s jewel-like singles obsolete. The Grand Sport featured here was powered by Parilla’s “high-cam” engine. 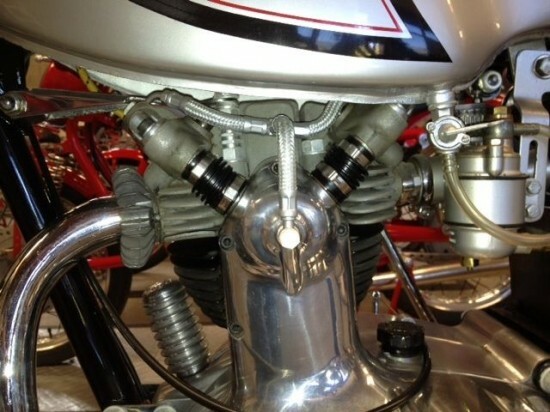 Valves were actuated by short pushrods enclosed in rubber boots [see above photo] and a cam set high in the block, and this allowed relatively high revs for a pushrod engine. It also allowed the head to be removed without disturbing the ignition timing. Most countries were happy with the 175cc version but, as always, Americans clamored for more power, so the engine was enlarged to 250cc’s. 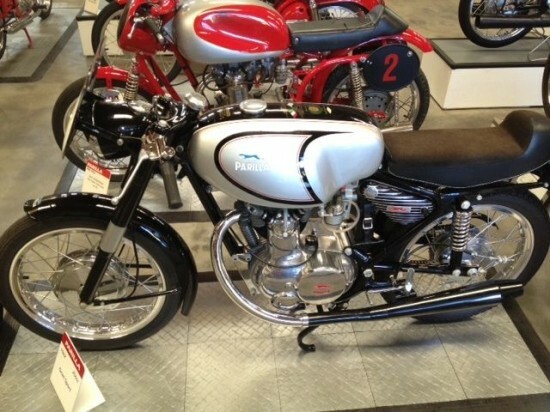 From the vintage Italian motorcyle museum of Mr. Guy Webster. This bike is in beautiful museum display condition. It has not been started in years but the motor was rebuilt about 15 years ago when the bike was restored. 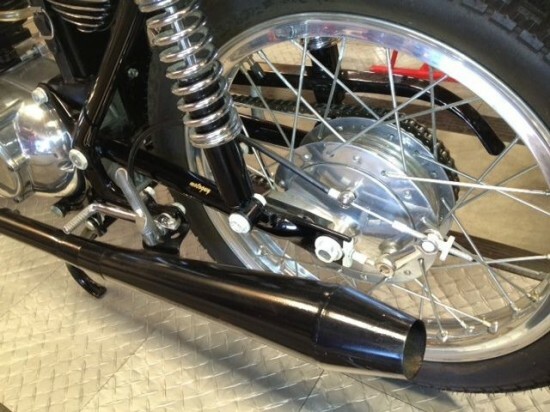 Despite being restored much of the bike is original unrestored as the bike was already in excellent condition. The motor turns freely and with good compression. This bike was one of the key exhibits in the “Art of the Motorcycle” Guggenheim exhibit as can be documented in the photo of the display card. This display document will also go with the bike upon it sale. That the bike has been beautifully restored, was owned by Guy Webster, and was the exact bike shown the famous Art of the Motorcycle exhibit all count in the “plus” column, although the fact that it is really in display-only condition for me personally counts in the “minus” column. But given this bike’s distinctive looks and history, this would make an excellent addition to the collection of anyone fascinated by small-displacement sports machines.